About: Christian Guémy, also known as C215 is a Parisian street artist focused on stencil graffiti. Born in 1973, C215 started spray-painting in 2005 and today he is one of the finest, and most productive stencil artists on the street art scene. Interact with the context, he places in the streets elements and characters that belong especially to the urban environment. He specially likes to show elements that society usually avoids to face: homeless people, smokers, street kids, and free love. Guémy’s daughter, Nina, is another inspiration for his work. “She is the subject of my work since she was born and it is mostly because of her that I became a painter. I have painted her portrait for the first time in 2007 and I have made more than a hundred different ones so far today. I want her later to understand how much I missed her, as we do not live together”. C215’s art captures a light, depth, and humanity that is difficult, and rare using stencils. This technique tends to flatten images and make them static, but C215 has developed a style of illustrating and stenciling that yields an impressionistic illumination of his characters. Even though his technique is meticulously refined, C215’s work transcends the formal and seems to get to the core of compassion and belief in the human spirit. Often has been described as “France’s answer to Banksy”, in addition to his street work, C215 also produces commercial artwork for galleries on wood and canvas. C215 has to date done a number of solo gallery shows around the world. In October 2014, C215 visited Valletta, Malta because of his interest in Caravaggio as well as 17th-century religious architecture. He produced various examples of street art on post boxes within the city, but unfortunately Malta Post removed the artworks after a few days. The mayor of Valletta, Alexei Dingli, regretted officially the act of Malta Post. Where you can see it: Nice, Paris, Montpellier, Barcelona, Murcia, Madrid, Vigo, Moscow, Saint Petersburg, San Fransisco, New York, Toronto, London, Bristol, Rome, Milan, São Paulo, Beijing, Istanbul, Oslo, Brussels, Prague and so much more. 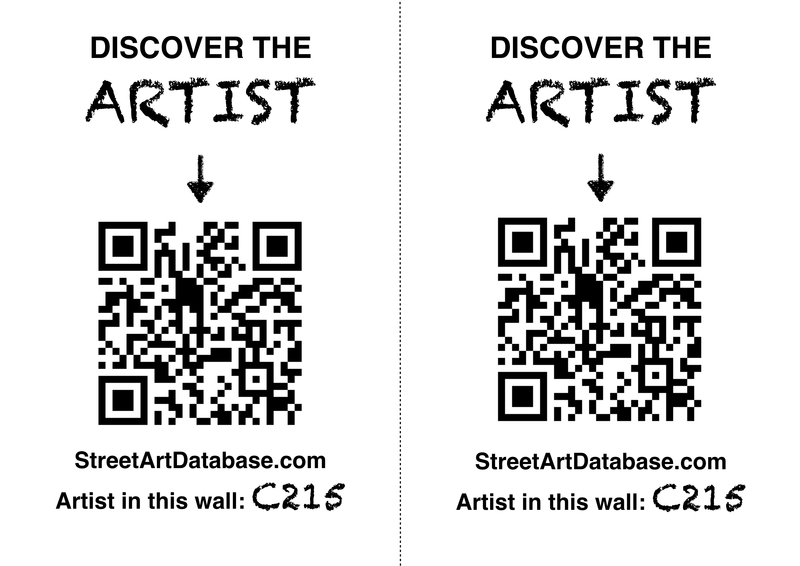 PRINT CODE: help tagging C215 in the streets of your city! Posted in murals, stencilBookmark the permalink.